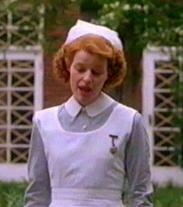 Lucy is playing Nurse Grace Ingham in Channel 4's 'Longitude'. 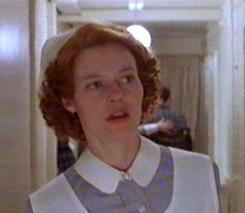 She only appears towards the end, and is the Nurse in the Mental Hospital that Jeremy Irons ends up in after he has a nervous breakdown. 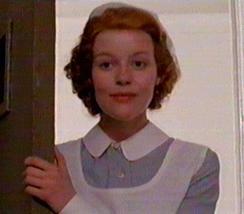 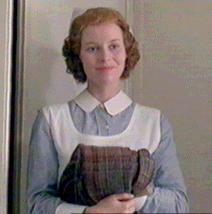 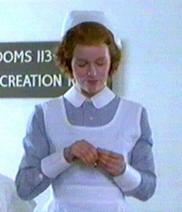 This was set at the outbreak of World War 2, so the uniform is typical of those worn by civilian nurses of the period. 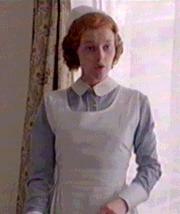 Grace Ingham played by Lucy Akhurst, 'Longitude', UK 2000.